This year, I turned 50. 50 years old. Half a century. Not a young kid anymore. But parts of me still feel young. I still laugh at stupid jokes. I still fall for sight gags. I still love the adventure of exploring the unknown. And I still sleep with a teddy bear. Shocking is it? Having a teddy bear at my age? Well, I actually have two bookshelves full. And that is an extremely pared down number from years past. You see, teddy bears used to be my only friends. It has taken me decades to grow enough trust in myself to be able to start passing on my support system to others. 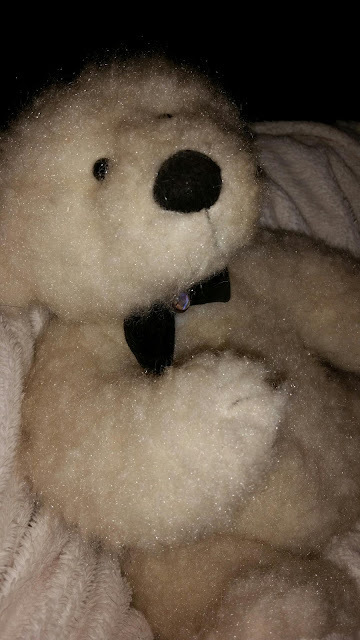 Here's my story: I started collecting teddy bears at a young age. I didn't have siblings the way most kids did. When i started walking, my brother and sister were already in their teens and had their own lives going on. I was “little sister” baggage to be left behind. So I was alone a lot. I understand that now, but I cried a lot at the time. And started to fill my bed with friends who looked as sad and needy as I was. But none of that happened in my bedroom. My personal sanctuary where all my animal friends were. I told them everything! I told all my secrets to my teddy bears. I told them my dreams and ambitions and they always supported me, never belittled me. I told them my problems and they commiserated with me but didn't blame me. I made mistakes and they did not get angry. They laughed and said it was ok and I'd do better next time. And my bears always hugged me. They were happy I was part of their lives. They never said i had ruined their plans. I loved my bears and they loved me. But beyond that, I had to learn to problem solve on my own. My siblings moved out and started college before I was even 10. I never had the confidence they had or probably the relationship with my mother that may have allowed for asking for advice. I learned early on that my interests and achievements would be shot down. So I utilized my fantasy world. I used my bears as different sides to every problem, argument, or decision that had to be made. It allowed me to come outside myself and gain perspective that others might have gotten from parents or siblings that I just didn't get. I learned to open my mind to several possibilities at once. This skill served me well all throughout my career and still helps as I try to teach my kids how to navigate life as it is today. As I grew older I had more in depth conversations with particularly favored bears. I worked out specific issues with them. I talked through friend problems, boy problems, peer pressure, and family problems with my bears. I did this all alone. I read self help books and psychology books but I liked talking it out so I used the bears. It has remained a safe way to let my mind flow when chaos seems to be what's taken over and order needs to be restored. The sad thing about it is the fact that normal relationships occur during middle school and high school that are supposed to act as sounding g boards and help build the self esteem you need as an adult. That never happened for me and lack of a parental role model to fall back on and take over left me to flounder. I turned inward and created a way to teach myself some higher level skills but the self esteem suffered and my overall shyness kept my in a self imposed prison for many years. My comfort was always a teddy bear or other stuffed toy somewhere because it could never hurt me or turn on me if I said something stupid. I am now 50 yrs old. And it finally just doesn't matter any more.